Evaluating the advantages that spray foam offers can be a great way to decide which the best choice for your home is. The advantages of spray foam insulation are a list of strong attributes that can help make your choice a simple and easy one. Create a quieter living space with its sound dampening qualities (excellent STC rating). Indoor living environments can be enhanced due to the foam’s ability to limit the infiltration of allergens and pollutants. When you spray foam your house you don’t have to have expensive duct testing done. Great climate control storage in your attic spaces. Although spray foam insulation does have an initial higher investment, the advantages that spray foam offers far outweigh the upfront cost. Also consider that spray foam insulation is not a do-it-yourself project. However, the advantage of a spray foam insulation installation is that you can ensure professional work done by an experienced and licensed contractor. When you factor in the performance advantage of spray foam insulation that allows you to save up to 50% on monthly heating and cooling bills every month, the return on investment makes up for the initial upfront investment. This is because spray foam fills all cracks and crevices where it is applied to limit air leakage which drives your heating and cooling equipment to work overtime to compensate for all that lost air. When you are thinking of insulation and start to think of the advantages of spray foam insulation, think no further than the attributes above and the long-term value that Insulation with Spray Foam Professionals has to offer. There are two different options available when it comes to selecting spray foam insulation. One has a sponge-like texture while the other is rigid and able to reject bulk water. We often are asked, “Which insulation is better for me?” They each have unique properties that allow them to be well suited for different uses. Built tough, this rigid spray foam performs extremely well in flood-prone areas since it can reject water. Closed cell foam can be applied directly to the subfloor of a home built on pier and beam foundation to create huge heating and cooling savings due to its vapor barrier quality. Closed cell foam is als perfect for your backyard shop or metal buildings or anywhere foam is going to be left exposed because it is sprayed flat and is very hard preventing damage. Closed-cell foam can replace the commonly used rigid XPS foam boards creating a seamless insulating envelope. Consistently outperforming traditional insulation types, this spongy foam provides excellent thermal insulation and air sealing. Open-cell foam also provides sound attenuation for a quieter living environment. The real advantage of open cell spray foam is how it thermogenically expands to fill in every crack, nook, and cranny that even the most vigilant fiberglass applicator could never fill. At just 3 inches thick you achieve an air tight seal that stops outside air leaks. Open cell spray foam is most commonly used in exterior walls where the soft foam will not be left exposed and roof decks. Here is a simple, easy to follow infographic that shows you the differences between the two types and how they both can provide consistent thermal comfort and air sealing year round. Is Spray Foam appropriate for hot climates? Hot or warm climates like the southern states of the USA can benefit equally as well as their northern counterparts from spray foam insulation. In fact, one area of the typical family home that can benefit from spray foam insulation is the unvented attic. 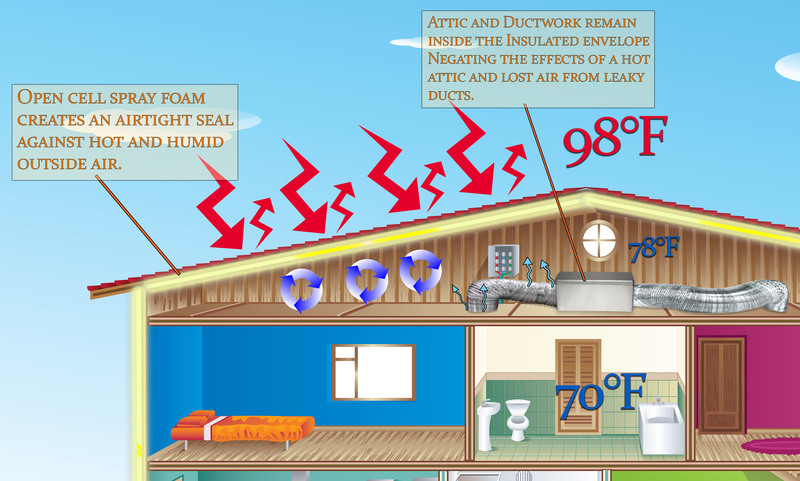 The graphic above demonstrates how an unvented attic with open cell spray foam insulation in a hot climate or can help regulate HVAC efficiency and maintain improved indoor temperatures. Won't sealing up my attic cause problems? Ninety-nine percent of moisture travels through the air. An integrated open-cell spray foam insulation and air barrier system minimizes air leakage and, therefore, accompanying moisture. Diffusion represents only 1% of the total moisture flow. Diffused moisture travels through the sheathing and the insulation to the interior space where it is easily removed from the air by the A/C system. The primary concern (other than the heat content of the escaping or entering air) of moisture-laden leaking air is when it is accompanied by a temperature drop, increasing condensation potential. We manage air-transported moisture with a continuous air barrier in the building envelope, built with interconnected spray foams. To be completely effective, air barriers should be in contact with thermal barriers (insulation). The moisture load and latent heat load is thereby dramatically reduced with the use of air-impermeable, open cell spray foam insulation. In plain words this means that 99% of the moisture that would be infiltrating your attic with another type of insulation is blocked by the spray foam applied to the roof deck and the other 1% is easily managed by the A/C system. As a recap the foam creates an air barrier, and thermal barrier something that no other insulation system can do. Can you compare Spray Foam Insulation to Blown In Insulation? Many homeowners make the mistake of trying to compare spray foam insulation to blown in insulation like fiberglass or cellulose, but the truth is, there really is no comparison. The words may have a similar connotation; after all, both involve spraying or blowing a product into an enclosed area of the building envelope, in order to insulate the home. However, that’s where the similarities end. While blown in insulation is generally made from some kind of fibrous material, such as cellulose, fiberglass or mineral wool, spray foam insulation is made from spray polyurethane foam. Open cell spray foam, because of its specific type of material, is able to create an effective air barrier wherever it is applied. This is due to its ability to expand nearly 100 times its original size, within seconds of application. In contrast, any type of blown in insulation may be able to fill tiny cracks and gaps, but it still allows for some air to pass through, which can result in air leaks, which can contribute to higher monthly heating and cooling bills. The airtight barrier makes up 50% of the overall efficiency of your insulation. No other form of insulation is going to create the airtight barrier that you get from an expanding foam and that is far more important than the R-value of your insulation choice. In addition to this the reduction in air moving through the insulation eliminates 99% of the moisture you would otherwise have to add an additional barrier to fibrous materials. If you don’t you risk humidity overcoming your HVAC system leading to condensation and potential mold, mildew, or water damage problems in the future. Most common insulation materials work by slowing conductive heat flow and--to a lesser extent--convective heat flow. Radiant barriers and reflective insulation systems work by reducing radiant heat gain. To be effective, the reflective surface must face an air space. Regardless of the mechanism, heat flows from warmer to cooler until there is no longer a temperature difference. In your home, this means that in winter, heat flows directly from all heated living spaces to adjacent unheated attics, garages, basements, and even to the outdoors. Heat flow can also move indirectly through interior ceilings, walls, and floors--wherever there is a difference in temperature. During the summer, heat flows from the outdoors to the interior of a house. Why is R-Value not a good measurement of insulation? We only lose about 20% of the conductive heat loss horizontally through a building’s walls. Therefore the R-value of the walls has very little to do with a structure’s total heat loss. But generally we lose 80-90% on the convection (wind blown heat loss) through those same walls. Consequently, sealing walls against wind loss is extremely important. That makes the “airtight number” the most important number. Thirty years ago, Witco Chemical Company, a major urethane supplier, did testing to determine what amount and thickness of urethane insulation were needed. They determined that an inch and a quarter of urethane in the walls of a home was more than adequate. One and a quarter inch of polyurethane sprayed properly in the wall of a house will prevent more heat loss than all the fiber insulation that can be crammed in the walls — even up to an eight-inch thickness. Not only does the polyurethane provide better insulation due to its airtight seal, it provides the house with significant additional strength. That is exactly right. An inch and a quarter of 2 pound density (closed cell) foam provides buildings with 99% of the insulation they can expect in the walls due to its airtight seal. It cuts heat loss as much as it can be practically cut. In 0.5 pound (open cell) foam you achieve your airtight seal at 3 inches plus you gain the higher R value of R-13. For the same dollar amount you can get 3 inches of open cell foam as 1 inch of closed cell foam. They will both achieve the airtight seal that is so important but you can gain additional R value from the open cell foam increasing the thermal resistance to heat conduction. See the included manufacturer data sheet for more information. Why are building codes wrong? Building codes are made by the state to ensure that when you have your house built that everyone from the Architect designing the plans, the contractor building the home, and even the subcontractor installing their material, build you a safe and efficient home. However there are some flaws in the way building codes are written and this is often times due to oversight or not being aware of the new technologies that have come out since the codes were last updated. These lapses in efficiency have a big impact on you the homeowner so we have put together this small graphic to help you understand how we can keep our insulation to code but also make sure you are not falling victim to outdated advice. In an attic with a bonus room code requires a minimum of an R-30 blown in fiberglass to be applied to any areas over heated square footage in the house. This makes sense, R-30 is the minimum amount of fiberglass to achieve a proper thermal barrier between your hot attic and the cooled house, however consider a bonus room wall where there is only an R-15 fiberglass required under the same attic heat load. Why is this? The short answer is that you can’t add more than that into a typical stud wall. But there is a clear deficiency in the thermal barrier created by that wall. There is a solution, by spraying an R-20 Open Cell spray foam to the roof deck you can eliminate the need for any interior walls to separate the conditioned square footage. By spraying your roof deck instead of filling the attic subfloor you also create an air barrier that keeps hot and humid air from infiltrating your attic. This also ensures that any leaky air ducts are leaking back inside of the “thermal envelope” sealing the house instead of into a hot attic.